Having wrapped up a significant portion of its plot lines last season, Justified‘s season premiere, “Hole In The Wall,” spends most its time establishing new story arcs and new characters to keep Timothy Olyphant as US Marshall Raylan Givens busy for thirteen new episodes. 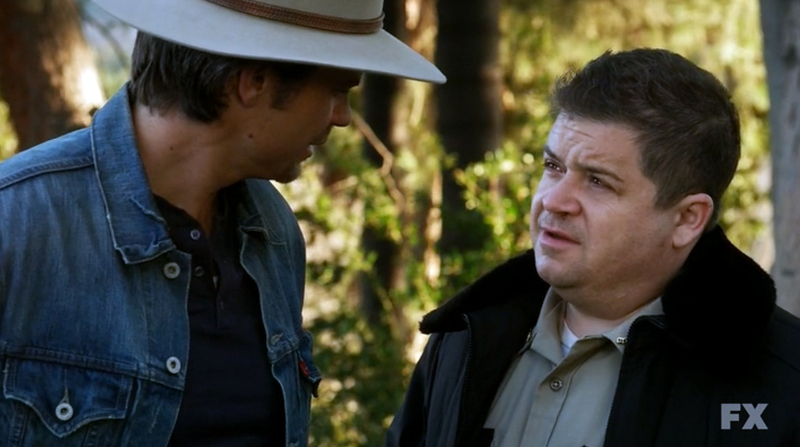 Most interesting right out of the gate is Patton Oswalt, playing an old high school friend of Raylan’s, Constable Bob. Bob is played most for sad sack laughs, but there’s a dark prepper edge to the Constable, including a violent attack on a high school classmate in his past, that points to a cauldron of volatile emotions beneath his self-deprecating demeanor. Also joining the cast is Ron Eldard as Colton Rhodes, and old army buddy of Boyd Crowder, played by the amazing Walton Goggins. Colton is a dangerous man, able to kill with a shrug of his shoulders and a well placed bullet. Colton’s savagery surprises even Boyd, who didn’t exactly order the man’s killing. “I told you to take care of him, not shoot him!” Shades of Abbott and Costello there. Speaking of Boyd, he’s expanded his reading over the hiatus. Though he’s usually fond of quoting the Bible, this year he gives us two choice quotes, one from atheist science fiction writer Isaac Asimov and the other from economist John Maynard Keynes. As a fan of both these authors, I was properly pleased, until I remembered that Boyd Crowder is a murderous drug dealing villain. Talk about mixed signals. Overall, the main thrust of the plot seems to be revolving around a treasure in the walls of Raylan’s father’s house. Raylan’s father Arlo, played by Raymond J. Barry, it should be remembered, is now in prison for murder, having taken the rap for Boyd Crowder (and having killed a man he thought was his son.) Whatever the treasure is that is concealed within the walls of his house, Arlo isn’t telling, and he’s willing to kill a fellow inmate to keep it all a secret. Arlo is also suffering from Alzheimer’s or some other form of senior dimentia, so count on this complicating the mystery. A rather sad and funny subplot concerns prostitute Ellen May, (prostitution being one of the many criminal enterprises Boyd Crowder and his girlfriend Ava are into) played by Abby Miller, who in a drug induced haze, shoots a customer, a “furry” dressed as a bear. 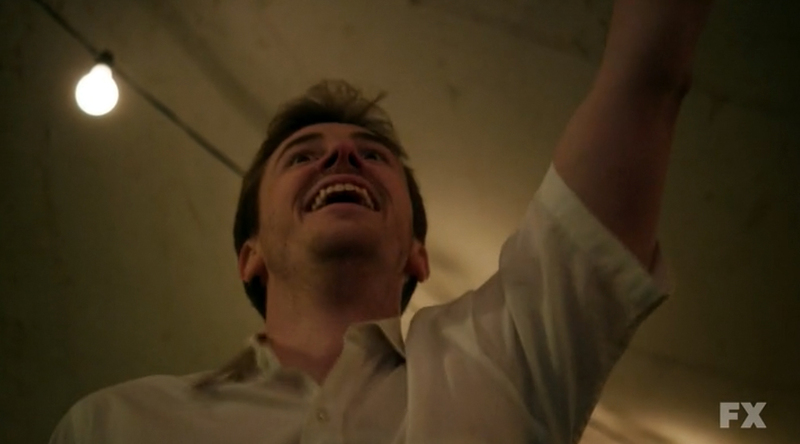 By the end of the episode poor Ellen May has fallen in with a mysterious snake handling church pastor, Billy St. Cyr, played by Joe Mazzello. The church will also play a large role in coming episodes, because it seems to be cutting into Boyd Crowder’s illegal oxy sales. Is the church simply a front for some kind of criminal enterprise? Is the snake handling preacher merely ripping a page from Boyd Crowder’s book, and doing Boyd one better? Right now Justified feels like two shows. One starring Tim Olyphant and the other starring Walton Goggins. In this episode they don’t meet, and don’t interact at all. 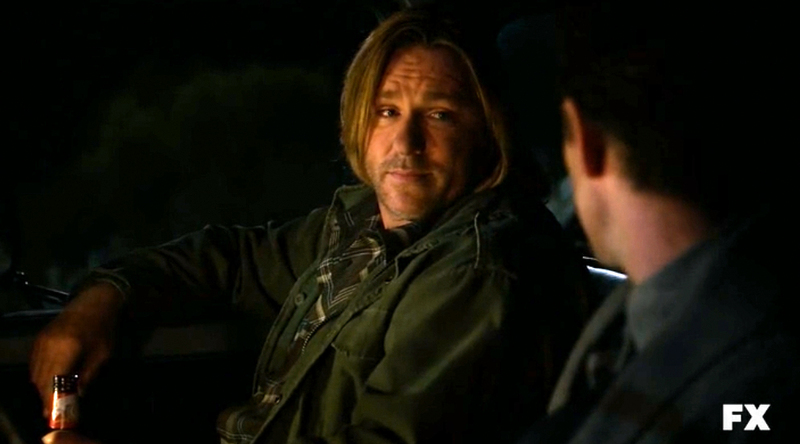 Raylan is busy illegally working as a bounty hunter for some old flame he met in Florida, and Boyd’s busy being a criminal mastermind. But as the season progresses, I’m sure the plot lines will intersect in unexpected ways.